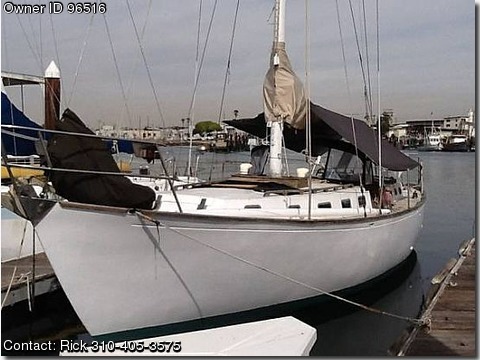 Please call boat owner Rick at 310-405-3575. 38' Sparkman and Stephens CC Sloop ,Sale or Trade ,World Cruising Vet, new main sail, new self tailing winches, Yanmar 2Qm20 Diesel, new exhaust and gauges, Aft cabin w/ head, forward cabin w/ head , new GPS/ Fathometer. New paint and bottom job. Will consider trade for Trailerable Sailboat, Truck ? Recent survey came in at $25,000. Reduced price: first $19,000 gets it. Lots of cruising gear comes with it, like a Monitor Windvane and Sextant etc. She is US Documented, custom built in South Africa and has circumnavigated 3 times! This vessel is proven, capable and structurally ready to go around again. Needs mast painted, deck and house paint, interior needs paint/ light carpentry in way of cabin trim and sole. Her 8 man Givens Liferaft is presently being repacked. Comes with lots of Charts and guide books.